Born: June 21, 1821 in Sandwich Ma. Where lived: 386 Barlows Landing Rd. in Pocasset Ma. 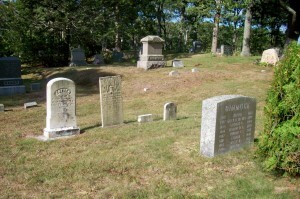 Married: March 28, 1847 in Lyme Ct.
1. Thomas Elnathan Dimmock; Died in infancy. 2. 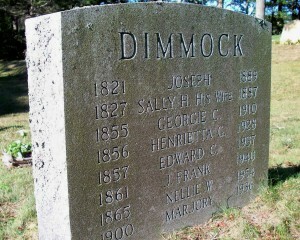 Willie Ford Dimmock; Died in infancy. 3. Georgiana Covell Dimmock; (1855 – May 4, 1910); She died in Bourne Ma. at 56 yrs, 10 mos, 6 d. & is buried in Cataumet Cemetery. 4. Henrietta Grace Dimmock; (March 10, 1856 – 1928); Henrietta is buried in Cataumet Cemetery. 5. Edward Covell Dimmock; (December 14, 1857 – July 20, 1937); He died in Bourne Ma. at 79 yrs, 7 mo, 6 d. & is buried in Cataumet Cemetery. 6. 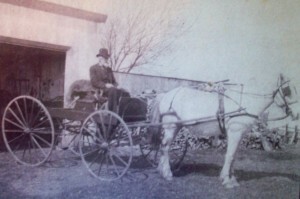 Joseph Franklin Dimmock; (January 13, 1861 – August 23, 1940); Married Nellie P. Wilder (1865 – 1954) (Lloyd W. Wilder & Martha Lovetteellotte) in Dudley Ma. on December 12, 1892; Joseph, Nellie & their daughter-in-law Marjory are buried together in Cataumet Cemetery.